So here is my first attempt at a tutorial online. Why did I choose a knot dress? Well, I personally love them. They are really girly and I love that it's so versatile. I can almost choose any type/color/pattern and find a way to get them all to come together. Also, it's great to wear alone on those warm summer days, but can so easily be paired with a shirt and pants when it gets cold. Too, it lasts SOOOOO long. My girls go back and forth sharing them. 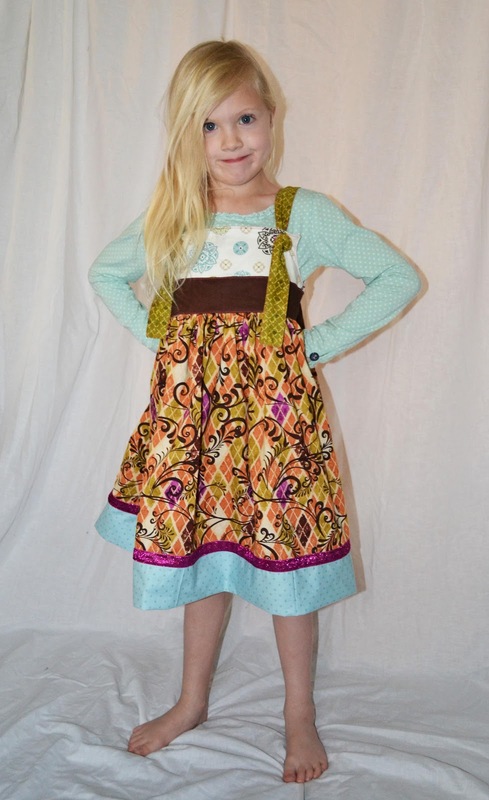 My 2 youngest can use it as a dress, where my older daughter uses it as a tunic. 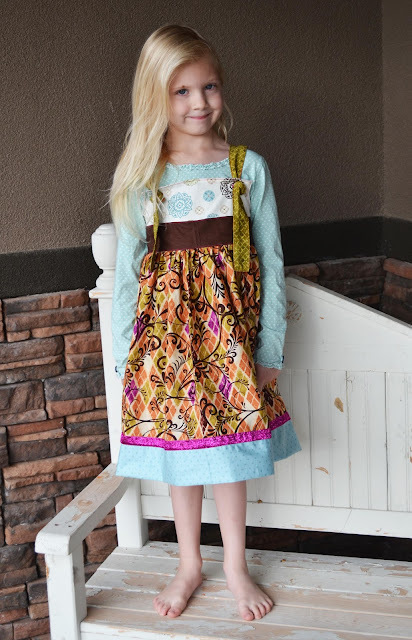 It's my go to for presents for girls cause it fits such a wide range of sizes and they can wear it for at least 2 years, usually longer (at least that has been my expirience). So how do we make this cute and adorable dress? For the one I'm making I chose 5 different fabrics. You will need a total of 2 1/2 yards of fabric and 2 spools of ribbon (about 3 yards) for a size 8. Mix and match, they can be as similar as you would like or crazy different. I sometimes have a color scheme and other times it's just a whole "whatever-I'm-in-the-mood" experiment. Play around with it. 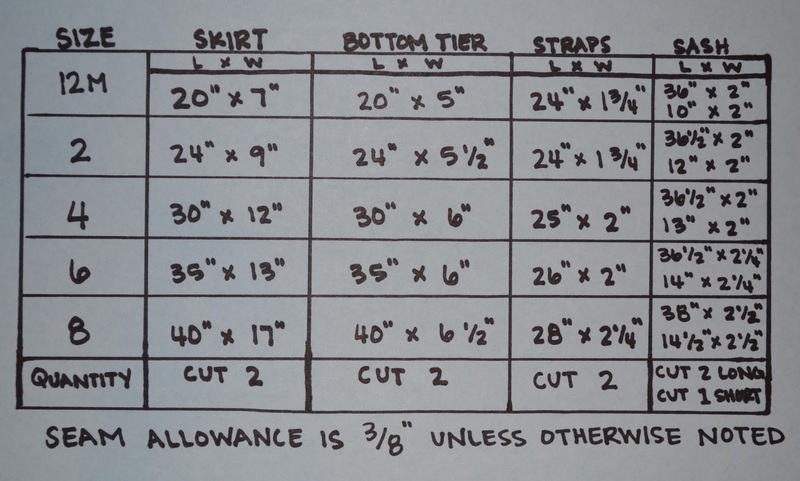 And here's the cut list for sizes 12m to size 8. I start off by putting a safety pin in the middle of the shoulder straps. Just below the fold. 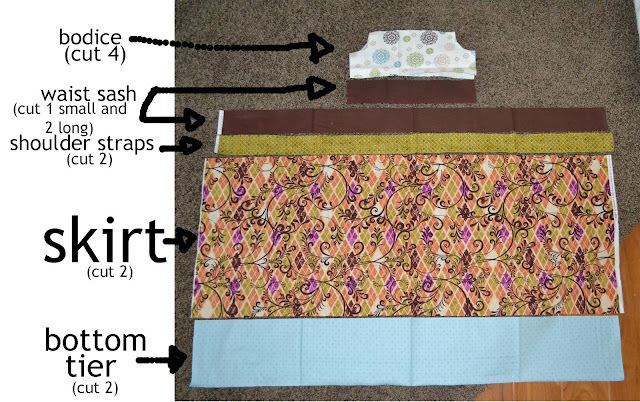 Remember to put it on the right side (rs) of the fabric so when you sew them you can push it through to turn them rightside-out. Line up the back bodice with it's lining and position the straps. 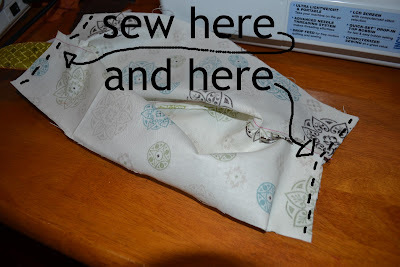 I usually place them 1/4" from the seams so when I sew them they align with the seam. Sew them together. Now make some cuts around the shoulder seams so when you turn it it will lie straight. 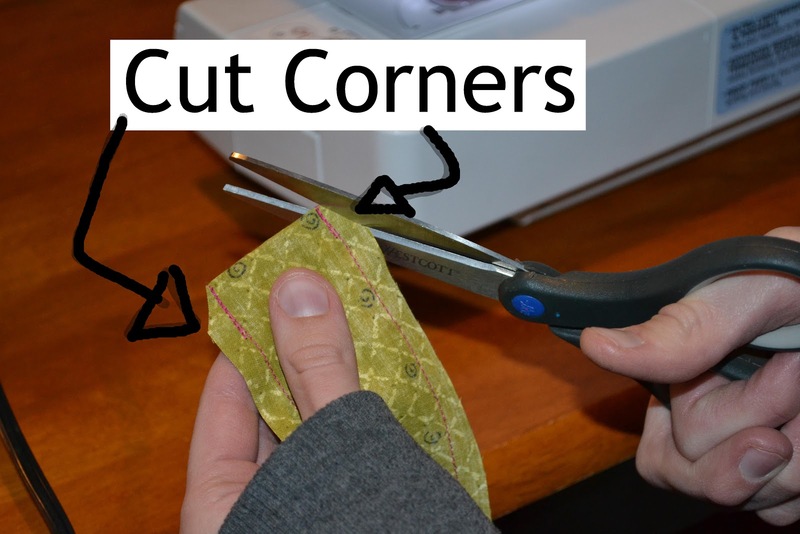 Just make sure not to cut into your line of thread! Once you've sewn both front bodice with its lining and the back bodice, line up the should seams and sew them together. Turn inside out and baste. 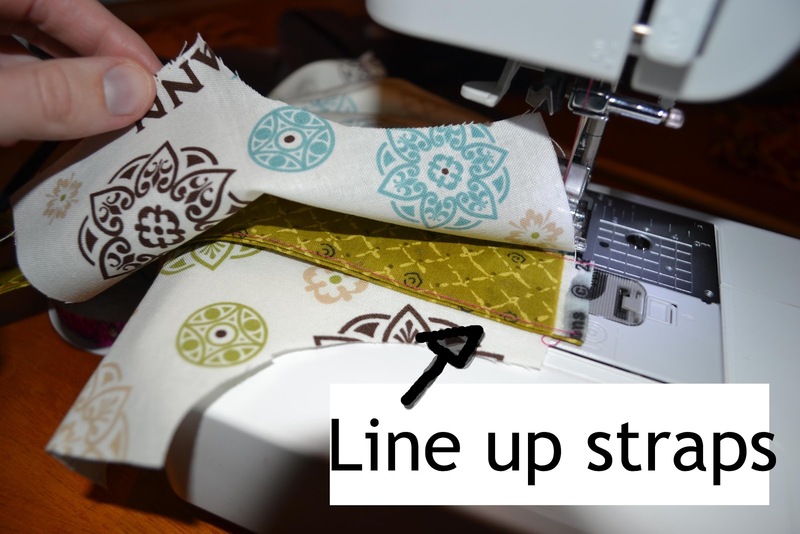 Use either the button-hole thing on your machine or do a very small zig-zag stitch around your marks. 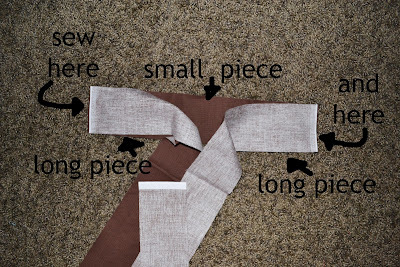 Sew the ribbon around so it hides the edge. 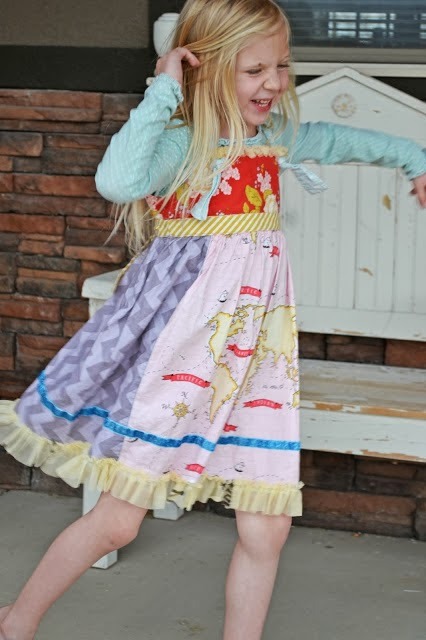 Now using your longest stitch, go around the top of the skirt so you can ruffle it up and sew it onto the bodice. I usually line up both side seams of the skirt with the side seams of the bodice and pin them there, then ruffle it up. Make sure you do right sides together though. 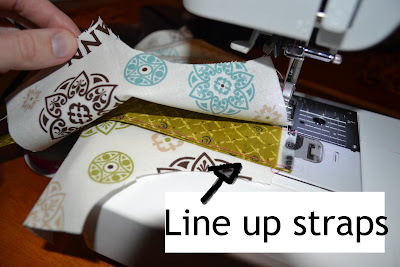 Either zig-zag stitch or use a serger. Turn and baste. Now for the sash. Take the middle piece and sew one long piece to each end. Now line that up the middle to the middle of the front bodice. 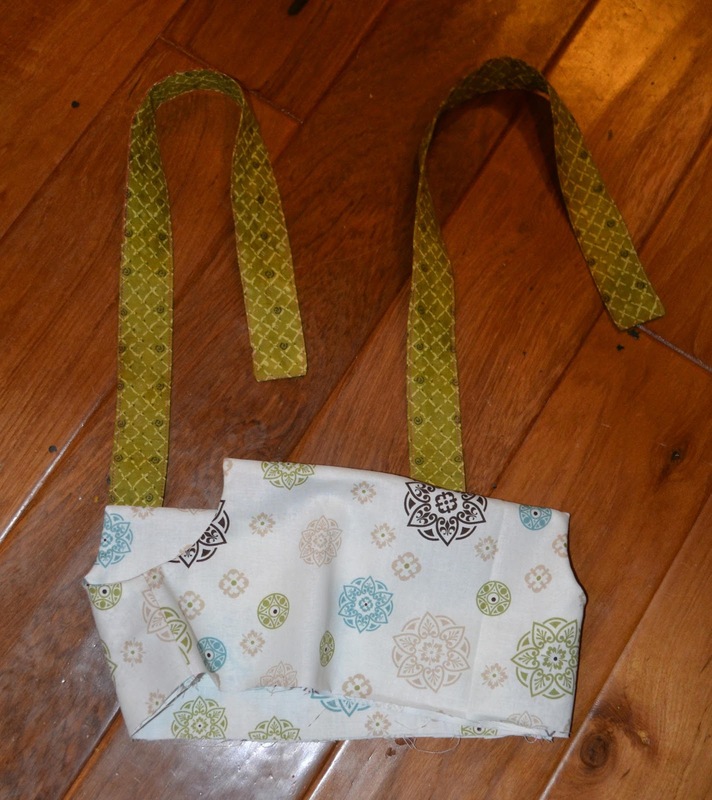 Pin on both sides and sew in place. 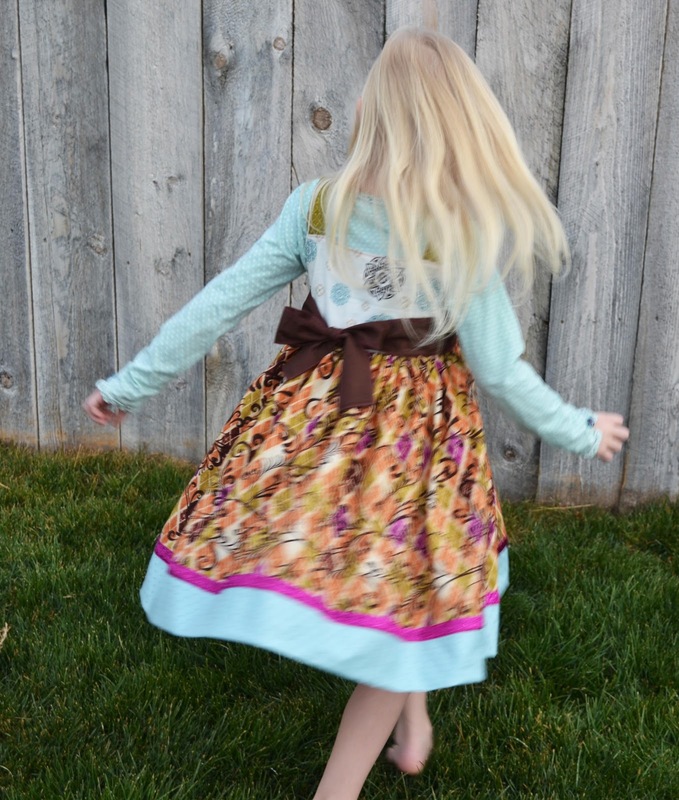 Put on your child and admire! Cute! Good job it looks great and easy too! Love this tutorial! Looks so easy. Do you have the measurements for the bodice? I'm having a difficult time when I go to print the photo and I want to be sure that I have the correct scale. Can someone explain to me how to print this pattern to get the above measurements? It isn't a pdf form, so I cannot get it to print the correct size.